1 Callander was an advocate of the Scottish bar but never obtained a practice. He instead devoted most of his leisure time to ‘classical pursuits’. In 1781 he was elected a fellow of the Society of Antiquaries of Scotland and published several books on a diverse range of topics, including St Paul's letter to the Ephesians (1779) and Two Ancient Scottish Poems (1782). See T. F. Henderson, ‘Callander, John (b. in or after 1721, d. 1789)’, revised Alexander Du Toit, in Oxford Dictionary of National Biography <www.oxforddnb.com> (1 April 2013), and Letters from Thomas Percy, D. D. afterwards Bishop of Dromore, John Callander of Craigforth, Esq. David Herd, and others, to George Paton (Edinburgh, 1830), x. 2 This was published in eight volumes from 1757. 3 <www.lib.uwo.ca/music/thedrsjamesandmargaretwhitbycollections.html> (1 April 2013). James Whitby's mother was a pianist, and he learned piano, violin and later viola at school. From 1943 he studied Natural Sciences at King's College Cambridge, where he became a member of the Cambridge University Musical Society Orchestra and took part in informal music-making. After periods working at London's Middlesex Hospital and Birmingham's Queen Elizabeth Hospital he left in 1971 for the University Hospital, London, Canada, where he worked until retirement in 1995. Whitby also had a minor career as a professional musician in Canada, and played viola in Orchestra London. He still regularly plays in a chamber ensemble with his wife, Margaret, on cello. James met Margaret at Cambridge, where she was an undergraduate at Newnham College. They were married in 1948, and Margaret spent the majority of her career in medicine. She played in the London Community Orchestra from its founding in 1973, and from 1979 until 2012 was its manager. I am grateful to James Whitby for providing me with these brief accounts of both his and Margaret's lives. 4 I am grateful to Kristina Dubois, who provided this extract. In addition, the Whitbys recorded that they visited Newcastle in about 1980, when their daughter was a Resident in the Royal Infirmary. During this visit they ‘spent some time removing the weeds and clipping the grass round [Avison's] grave’. 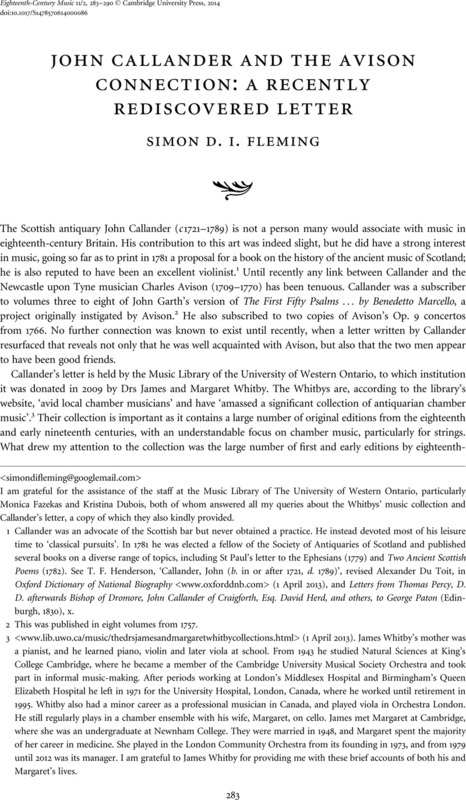 5 The letter is part of the Dr. James L. and Dr. Margaret Whitby Antiquarian Music Collection – item AV16 – Drs. Whitby 2009 – Box 2. 6 Sothebys, , Fine Printed and Manuscript Music including the Mannheim Collection … Friday 6 December 1991 at 11.00 am (London, 1991), 52. The letter was purchased at this auction by an agent on behalf of the Whitbys. 7 If Page was not the correspondent, then he must have been presented with the letter at a later date. Page's note is barely legible, but it refers to Callander when it says that the ‘Editor of Ancient Scottish Poems, with Notes & annotations. Edin. 1782. sent an most interesting letter … on the subject of Mr Avison’. 8 Edward (1747–1776), Jane (1744–1773) and Charles junior (1751–1795) were the only three of Avison's children to survive childhood. Edward became the organist of St Nicholas's Church on the death of his father and took over the Newcastle concerts. Charles junior was also active as an organist and composer in Newcastle. See Fleming, Simon, ‘Charles Avison Jnr and His Book of Organ Voluntaries’, The Musical Times 153 (Spring 2012), 97–106. 9 The Monthly Magazine 34/2 (London, 1807), 198. A comptroller was a managerial position whose duties involved the supervision of a company's accounts and finances. 10 The Universal Magazine 3 (London, 1807), 461. 11 Page also subscribed to John Garth's Op. 2 keyboard sonatas (1768), Thomas Ebdon's Sacred Music (1790) andDibdin, Charles's Musical Tour (Sheffield: J. Gales, 1788). 12 National Archives: Prob 11/963. 13 Brown was appointed vicar of St Nicholas's Church Newcastle in 1760; he was well known as a writer and was a capable violinist. He had probably known Avison for many years, as Brown was a part of an exclusive club based in Carlisle, who frequently met to converse and make music, and Avison occasionally attended their meetings. See James E. Crimmins, ‘Brown, John (1715–1766)’, in Oxford Dictionary of National Biography <www.oxforddnb.com> (4 April 2013), and Gilpin, William, Memoirs of Dr. Richard Gilpin of Scaleby Castle in Cumberland, ed. Jackson, William (London: Bernard Quaritch, 1879), 74–82. 14 [Hayes, William,] Remarks on Mr. Avison's Essay on Musical Expression (London: J. Robinson, 1753), 113, and Avison, Charles, A Reply to the Author of Remarks On the Essay on Musical Expression (London: C. Davis, 1753), 4. Avison's Reply was attached to the second edition of his An Essay on Musical Expression. A third edition of Avison's Essay was issued in 1775 (London: Lockyer Davis). 15 The most recent biography of Avison is by Southey, Roz, Maddison, Margaret and Hughes, David, The Ingenious Mr Avison: Making Music and Money in Eighteenth-Century Newcastle (Newcastle: Tyne Bridge Publishing, 2009). 16 Gifford, John and Walker, Frank Arneil, The Buildings of Scotland: Stirling and Central Scotland (New Haven: Yale University Press, 2002), 349. 17 The reference to Avison's Edinburgh job offers is taken from a letter that was published in the Newcastle Journal on 17 March 1759. The author of the letter, who referred to himself as ‘Marcellinus’, was most probably John Garth. It was written in defence of Avison, who had been criticized for assuming sole control of the Newcastle subscription concerts. 18 An advertisement for 1790 recorded that the coach between London and Edinburgh would, after a night spent in Newcastle, reach Edinburgh the next evening. Argus, 15 March 1790. 19 These were published in 1740, 1751, 1755 and 1766. 20 Newcastle Courant, 17 April 1756, and Edinburgh Evening Courant, 1 January 1757, 13 January 1757, 5 January 1758, 3 March 1759, 7 April 1762. After his relocation to Edinburgh, Gelson began to spell his surname as ‘Gilson’. 21 Gelson subscribed to Avison's Opp. 3 and 4 concertos. Simon Fleming, ‘A Century of Music Production in Durham City 1711–1811: A Documentary Study’ (PhD dissertation, University of Durham, 2009), 69, 153–154. 22 Bowes's wealth was founded on the coal trade. As well as being a supporter of the arts, he was the MP for County Durham and owned the large Gibside estate situated eight miles southwest of Newcastle. Jennifer Gill, ‘Bowes, George (1701–1760)’, Oxford Dictionary of National Biography <www.oxforddnb.com> (5 October 2013). 23 We also know from Bowes's accounts that Avison was in London in 1728, when he acted as a witness for Jenison, who in that year presented three separate bills for payment at Bowes's London bank. Southey, Roz, ‘Researching Avison's Life: The Early Years’, The Avison Ensemble Newsletter (Newcastle, Summer 2012), 3. 24 County Journal, 9 March 1734. 25 Burney, Charles, A General History of Music, from the Earliest Ages to the Present Period, volume 4 (London: Printed for the author, and sold by T. Becket, J. Robson and G. Robinson, 1789), 670–671. 26 These were published in 1756, 1760 and 1764. 27 The name ‘Brown’ appears to have been added to the top of this letter afterwards, most probably as a reference to Dr John Brown; see Figure 1. 28 Above the underlined part the alteration ‘I have been his Visitor’ is written. 29 Callander is here referring to Avison's An Essay on Musical Expression. 30 Avison thought that fugues could be ‘unsufferably tedious: Their barren subjects affording no Variety in themselves, are therefore often repeated entire; or transposed, or turned topsey-turvey, insomuch that little else is heard throughout the whole Piece.’ An Essay on Musical Expression, 39. 31 Compare Avison's observation that the organist ‘is too often so fond of his own Conceits; that with his absurd Graces, and tedious and ill connected Interludes, he misleads or confounds his Congregation’. An Essay on Musical Expression, 77. 32 Avison had married Catherine Reynolds on 15 January 1737 at All Saints’ Church, Newcastle; she died on 15 October 1766. Catherine appears to have had little to do with Avison's musical activities but did for a time teach needlework, as reported in the Newcastle Courant, 21 January 1738. See Simon Fleming, ‘Charles Avison (1709–1770): An Important and Influential English Composer, Musician, and Writer’ (MMus dissertation, University of Liverpool, 1999) 47. 33 This quotation is taken from Shakespeare's Hamlet, Act 1 Scene 2. I am grateful for the assistance of the staff at the Music Library of The University of Western Ontario, particularly Monica Fazekas and Kristina Dubois, both of whom answered all my queries about the Whitbys' music collection and Callander's letter, a copy of which they also kindly provided.